Experience Africa was first founded in 2009 due of two considerations. Firstly, our founding company www.CapeVillas.com made several lucrative multi-leg villa bookings which included stays in safari lodges, where the safari component created greater income than the villa. And secondly, regarding to the Cape Villas.com magazine which was distributed with Condé Nast Traveller in February 2009. Whereby we considered a pan African follow up including safaris, private islands and resorts that would appeal to a wider audience. 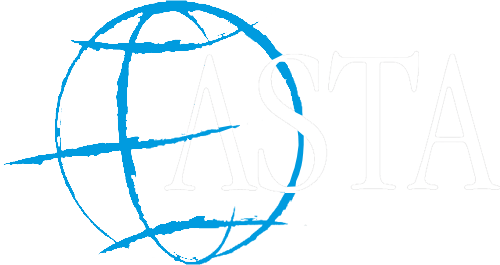 So, in mid-2009 I purchased the domain name Experience Africa.com and appointed a web new development company to create a website, per my design specifications. 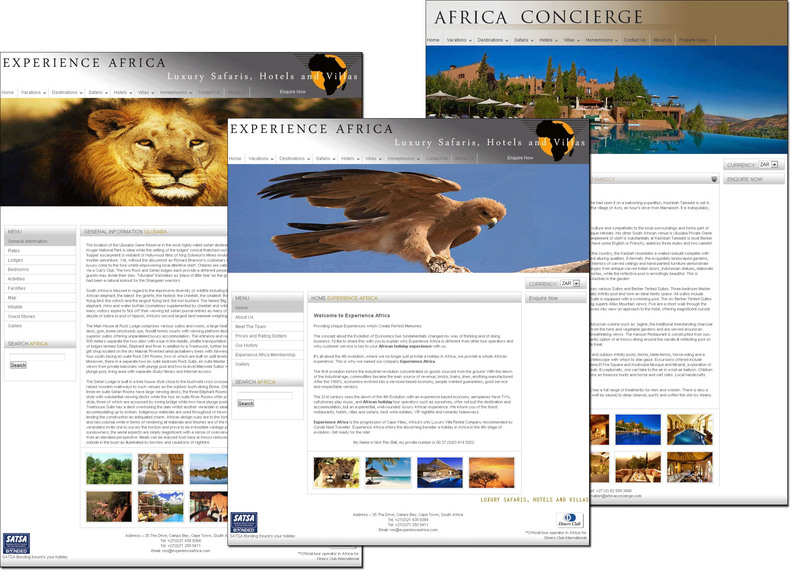 By 2010 we have an attractive website and shortly after we made a deal with Sotheby’s Realty Cape Town to duplicate the ‘Experience Africa.com’ website as ‘African Concierge.com’ for a split in their commission. 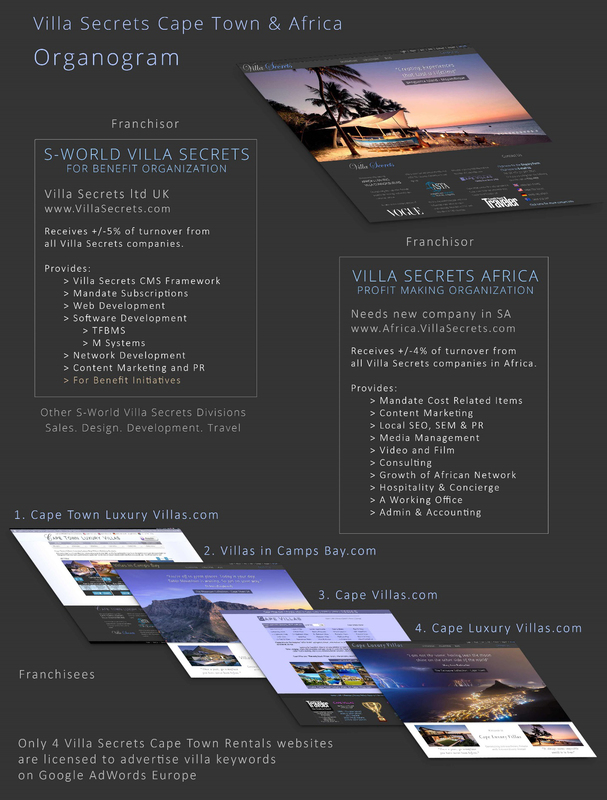 This duplication of a website concept is one of the founding principles behind the S-World Villa Secrets franchise plan. Unfortunately, whilst it was a good plan, it was a bad website. Whilst it looked good that time, its CMS (Content Management Suite) was poorly designed and buggy. So much so, we had to scrap the first website in its entirety. However, it did not stop the concept from taking centre stage in the original S-World business plan in March 2011. However, as this business plan developed into first S-World and then American Butterfly a ‘for benefit’ macroeconomic hypothesis; for the best part of 2011 and 2012 Experience Africa was forgotten. Experience Africa as a concept would not be mentioned within American Butterfly the 4th book ‘The Butterfly’ in March 2013. Before which American Butterfly described a disruptive macroeconomic theory ‘The Theory of Every Business,’ where after the books ‘Spiritually Inspired Software,’ & ‘The Network on a String’ explored elements in higher math as the foundation for the digital network (See network.villasecrets.com > S-World). Finally, the fourth book ‘The Butterfly ‘was written and built around a SWOT analysis and a flow diagram of the companies and institutions we desired to work with on the project. Like everything else in American Butterfly the original plan in ‘The Butterfly’ was ‘thinking big.’ Book 1: ‘The Theory of Every Business’ considered disruptive macroeconomics and described a single resort network, (a 9 square mile large property development in Orlando Florida). Where after Book 3 The Network on a String developed into extreme macroeconomics and in Chapter 7 ‘Angel POP’ desired the system that would see precisely 32,768 of such developments populate the planet. The 2013 concept for Experience Africa was to create as many nature reserves as possible attached to each resort network to act as Ark’s for the endangered animals. This was far from a perfect solution, as it was moving animals out of their natural habitat, but given the success of the network, it was one of very few solutions on the table. However, within the SWOT analysis of American Butterfly Book 4, the lack of a product or prototype was a great weakness. I had to learn systems architecture, then build a great looking prototype and create simple but powerful CMS. 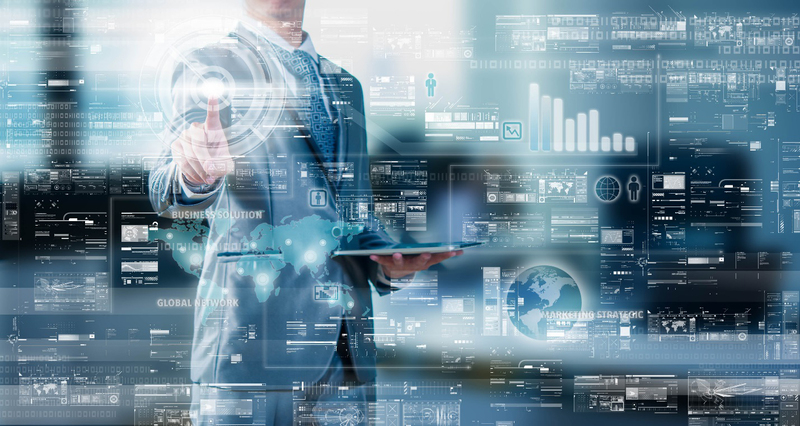 Then get started on XML connectivity and the creation of the business and financial software. This was going to take a few years and cost me every penny I would earn. 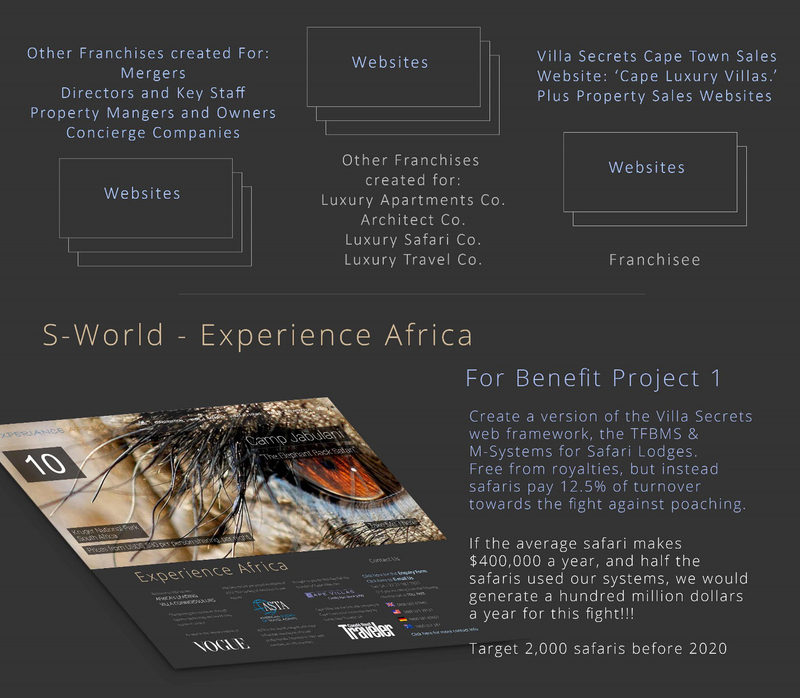 After a little experimentation on Experience Africa in 2014, I only re focused on Experience Africa in the fall of 2015, having created the successful Villa Secrets prototype www.cape-town-luxury-villas.com and the first version of www.villasecrets.com. 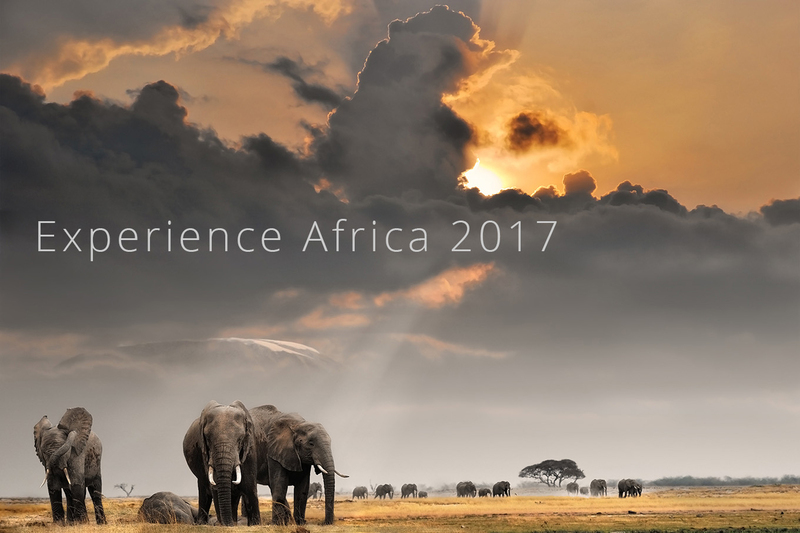 At the time, we quickly created a WordPress website for Experience Africa. It won’t look like this forever, but right now you can see the original theme www.experienceafrica.com. The idea was simple. We would make many websites and use only 10% of turnover for operations and donate the rest (between 10% and 25%) to conservation companies. For a month or more we worked on this idea and one can see the evolution of the project at that time on my Google Plus Channel. Here are some of the later editions. 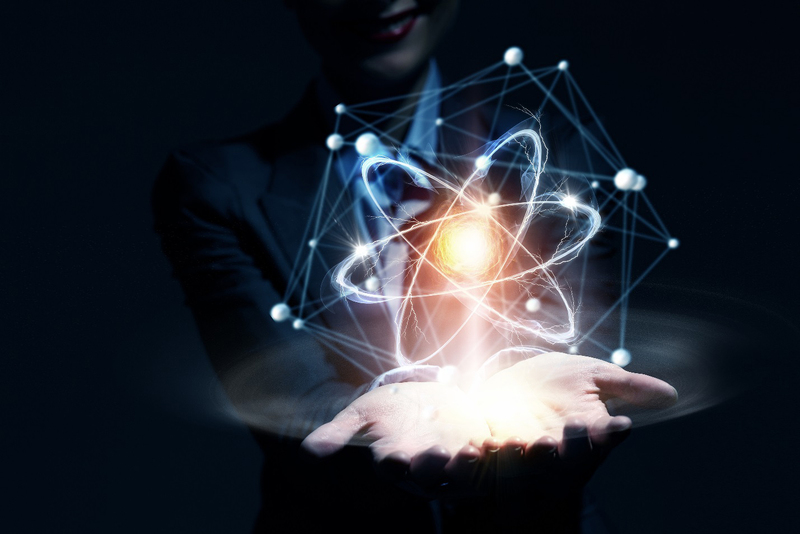 But note that the forecasts presented at the time did not use the ‘quantum safer forecasting’ which we use today for Villa Secrets and the expectations from content marketing was most likely over optimistic. The original plan was very similar to Villa Secrets, in essence create a great many companies using our framework and systems to generate profit, backed up by a truck load of content marketing. Marketing that would be more effective due to its conservation message. Soon after creating the first website I looked into the legalities of charities and non-profit companies and in the UK, the vehicle was to open a registered charity (which will be ‘The Sienna Foundation) and open a separate company owned by The Sienna Foundation that traded. Like Oxfam which has a separate company for the creation and sale of branded goods. During this process, I discovered Google Grants, which offered $10,000 a month in free advertising for qualifying non-profit companies. Which was very useful especially if we made hundreds of sites for hundreds of different conservation groups. However, this was an uncertain path, as there was little information of what qualified a company or not. As such a system was already in the plans for Villa Secrets, it was a project that needed little or no funding. So, in December 2015 web and content development for Experience Africa was put on pause and in its place, began the development of what started as ‘The Divergent CRM.’ Which metamorphosed into the TFBMS (Total Financial, Business & Marketing System) and M Systems (A powerful 16 point divergent economic system which mimics nature based on M Theory). The organogram that follows is a representation of Villa Secrets today, at the point where we are about to create the first networks. All of which will contribute funds for the development of the Web Framework, TFBMS and M Systems. Given a good roll out in Villa Secrets, and this would include breaking the USA in the first half of 2017. We could have a safari lodge product ready before 2018 with prototypes ready for alpha testing in the Summer of 2017. It’s been less than a week since I had a meeting with the representatives of one arguably of the top 2 Safari managements companies. In which the idea of changing to the Experience Africa systems (when ready) was received well. Which has greatly encouraged me, indeed if not for that meeting I’d likely not be writing this now. So let’s a have a quick look at the math, I used in the above S-World Villa Secrets Organogram. The weakest and most unpredictable part of the equation is of course ‘E’ and the percentage of enrolment. However, our answer to this weakness is simply that 2000 safari is not a touch on the 400,000 Villa Secrets franchises that we wish to create. 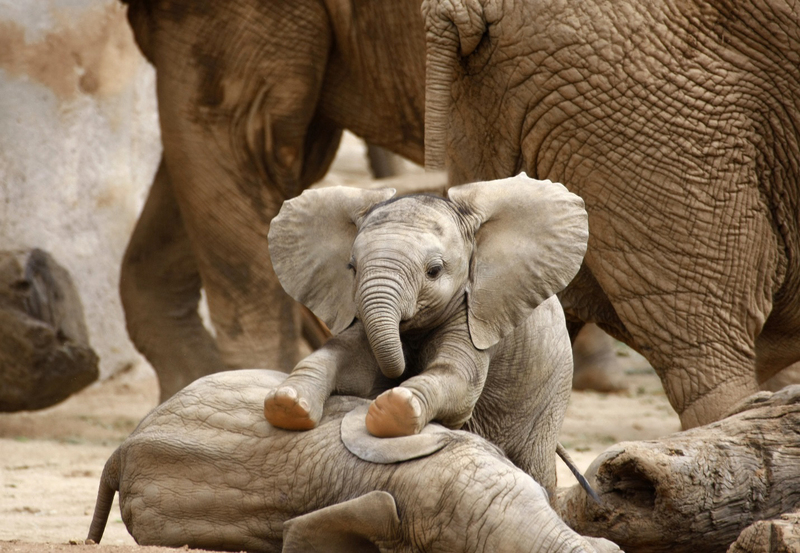 In the financial Interest of the Safari Companies. For it to be in the financial interest for a safari to use our systems, we need to mitigate the new 12.5% cost. To do so we need to make sure the company makes 16% more income from using our systems. To create a tipping point we also need to go back to basics and consider the idea of the creation of hundreds and maybe thousands of tour operator websites, operated by the many charities and non-profits already working on African Conservation. The Villa Secrets framework is already pan African and we already have several safaris on line. So we can potentially add an awful lot of residual income from charity run Experience Africa agents and operators. However, this is not the only advantage of creating a mass of tour operator websites and non-profit companies. If one has the critical mass of tour operators and websites then the Safaris will join the network not just for the software but for the network, if that is where many or most of the bookings are coming from. 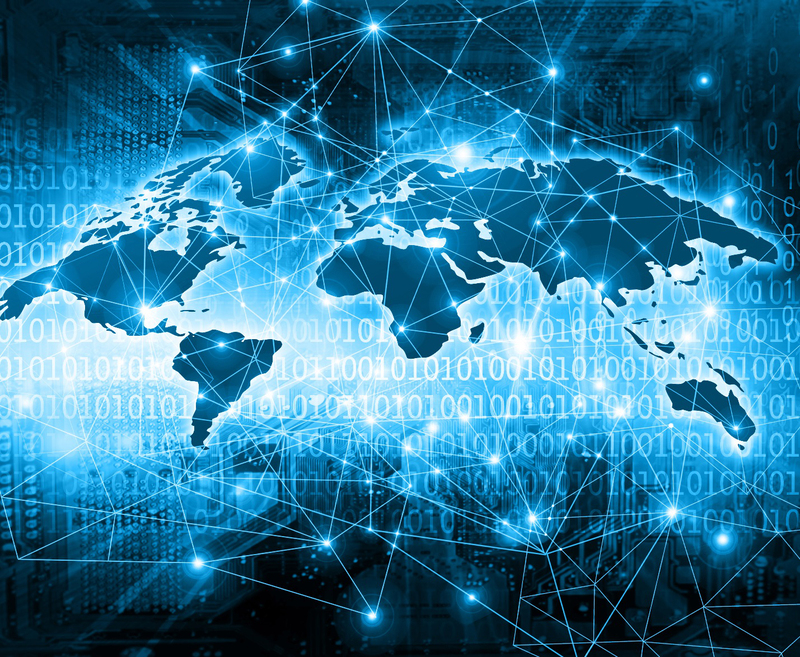 In addition we can also consider that in terms of booking systems we are creating a next generation product and we have a great desire to either partner with or buy booking systems and integrate them into the network. Lastly is the significant PR we will generate. 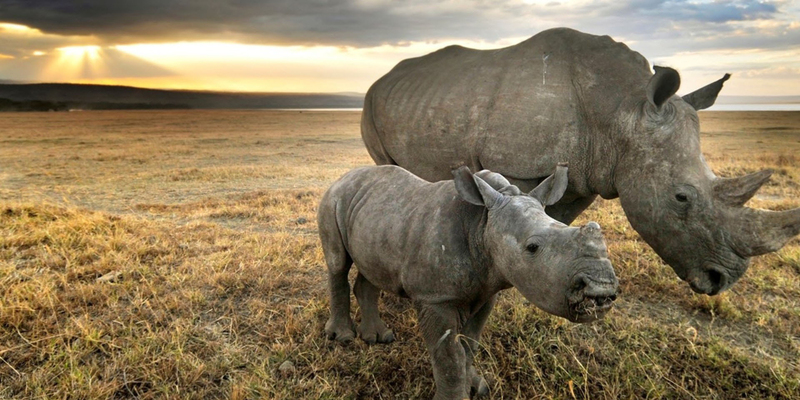 As at the end of the day, given that this is a perfectly reasonable plan that has the potential to greatly and sustainably increase the funding of poaching by a factor of more than 2 (so Experience Africa initiatives generate more than double the current funding from all other sources), its good news. And a great flagship project for S-World to deliver on its promises in a time that is meaningful. We shall continue progressive (divergent economic) charity in S-World Special Projects in ‘Sienna’s Forrest’s,’ in which we seek to turn rainforest into a commodity, and in so doing make it unprofitable to log. ‘Sienna’s Forests dovetails perfectly with Experience Africa as after poaching the second biggest threat to the elephants and rhinos is the loss of their environment. Through all and by any means necessary we wish to generate income and raise money to purchase great chunks of forest and natural habitat in Africa and beyond. So, protecting the environment of the animals in Africa and the ferrets from deforestation across the globe. Given its potential for success and given the subject matter, we would greatly like the endorsement of the Clinton Foundation and the Princes Willman and Harry, who are both very concerned of the poaching situation. 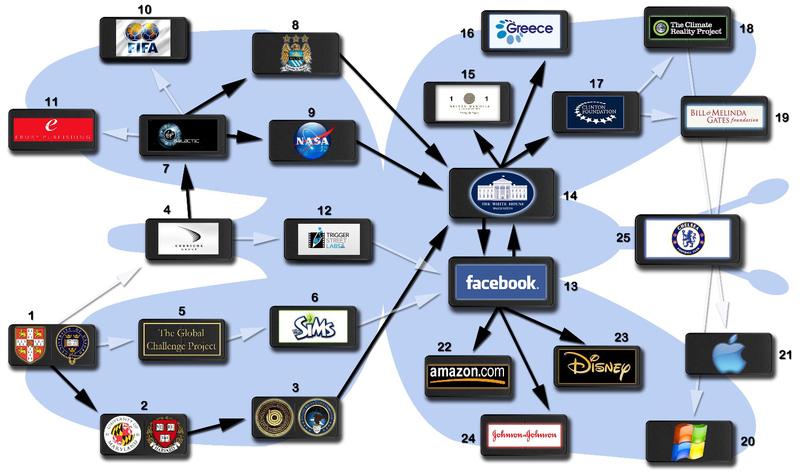 It’s a long story… but in the early days of S-World both Bill & Melinda Gates and Mark Zuckerberg were major influences. We desire each to assign some programmers to our cause, which given the potential is not an unreasonable request. In fact, we desire many companies to assist us with programmers. Whilst this job can be done under our own steam by 2020, it could be done bigger, better, and quicker given the resources.